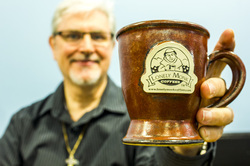 The monk is known for single-minded dedication to his vocation, service to God and community. Lonely Monk Coffees is founded on our passion for fine coffee and our single-minded commitment to provide you with the best possible coffee experience. Our coffees are of exceptional quality and purchased in a way that fairly values the coffee grower. Our unique Micro-Roasting process creates the freshest and most expressive cup of coffee you've ever tasted. We are not satisfied with a sale unless you are satisfied with our coffee. We are proud to bring you fine coffees for a fair world.